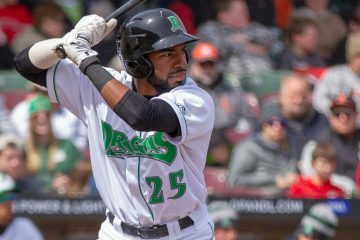 Narciso Crook began the 2015 season as the only teenager on the Dayton Dragons roster. The 19-year-old spent the previous season with the Arizona League Reds. The first week of the season he showed good power, smacking three doubles and a triple while hitting .261, but it also came with 11 strikeouts in 24 plate appearances. The second week was a struggle for Crook as he hit .158 (3-19). It was more of the same in the final week of the month for the outfielder as he hit just .21 7with a double and triple. For the month he would hit .215/.235/.354 to go with just two walks and 26 strikeouts in 68 plate appearances. May got out to a nice start for Crook as he had hits in five of the seven games in the first week, hitting .280 with a double and a home run. More importantly he had a walk and just two strikeouts. It would be nine days before he would take the field again, returning on the 16th against Lake County. The first week back was a struggle as he went just 5-25 (.200) wit a walk and five strikeouts. Over the final week of the month he would run off a 7-game hitting streak, but all games included just one hit as he hit .259 in the span. For the month he would hit .247/.275/.299 with three walks and 14 strikeouts over 80 plate appearances. The Dominican Republic native really cut down on his strikeout rate, but his walk rate remained low. 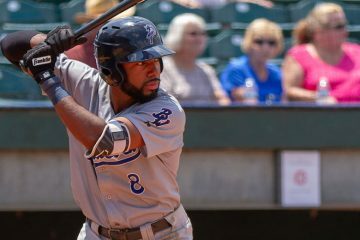 June began with a hit in two straight games to extend the hitting streak to nine, but it would end there and Crook would go hitless in the final two games of the week. In the four games played in the second week of June he would go 0-13 as the slump continued. The struggle carried into the third week as the outfielder went 3-21 with 11 strikeouts and no walks. After five days off he returned to the lineup and caught fire over the last four games of the month, going 7-15 (.467) with five doubles. For the month he would hit just .188 with one walk and 18 strikeouts in 66 plate appearances. Entering July with a four game hitting streak, it was extended to seven games before going 0-5 over the final two games of the first week. The second week was a bit of a struggle as Crook went 4-20 with two doubles and a walk. He would play in just three games over the third week of the month, going 1-10 with a walk and a double. The final eight games of the month were very hit-or-miss. In the first three games of the stretch he went 9-14 with four doubles and a home run, but went 1-16 over the final five games. He finished July with a .237/.284/.408 line with four walks and 22 strikeouts in 82 plate appearances. 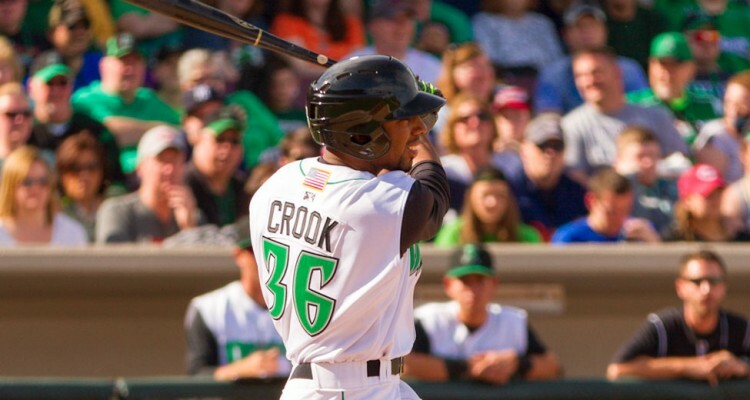 The first week of August was a struggle for Crook, going 2-13 (.154) with a home run and a walk. It was more of the same in the second week, going 3-17 (.176) with another home run, two walks and just three strikeouts. Things began to pick up in the third week of August for the outfielder, going 7-21 (.333) with a double. 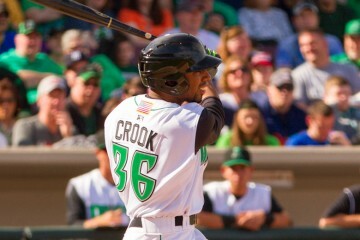 The final week of August was huge for Crook as he hit .304 and slugged .652 with two walks and just four strikeouts. That carried into the final week of the season as he went 8-25 (.320) with a triple and a home run. Over the final five weeks of the season he would hit .273/.314/.475 with five walks and 23 strikeouts in 106 plate appearances. Hitting | His hit tool is below-average for the level he’s at now and it projects as a below-average tool moving forward. Power | Crook has slightly above-average power potential with 20 home runs in the future not being out of the question. Running | He shows off above-average speed. Throwing | He’s got an above-average arm that plays well in right field. Defense | His speed let’s him cover center field right now, but he’s not a big league caliber center fielder and will eventually find himself in one of the corners – likely right field because his arm plays well there. Raw and toolsy best describes Narciso Crook at this point of his career. He stands out on the field both from a physical standpoint as well as a tools standpoint. His swing isn’t the smoothest around, which does leave his hit tool looking like it’s going to be below-average for the long run. It doesn’t help that he’s got some struggles with pitch recognition, though it did improve as the season went along. There’s some offensive upside with Crook with his power and speed combination and if he can get the most out of his hit tool, while adding in some walks as he moves forward, he could profile with a solid bat. He battled with his consistency throughout the season on the offensive side of the ball. There were also some consistency problems in the field, particularly the corners where he made five errors in 42 starts between left and right field. He was much more consistent in center, but will need to improve his defense on the corners. Look for him back in Dayton to begin the 2016 season. Where will the Reds play Jose Peraza? Who’s Hot on the Cincinnati Reds farm? Crook was overmatched at times but has all the tools and is a physical specimen that reminded me of Mike Cameron. Hopefully he gets another shot at Midwest League. We have to sop drafting these types. Im all for getting raw talent, but we draft the same guys over and over. Slow bat+bad eye=BIG SWING AND A MISS. I would rather the reds cut back on the heavy upper management, and add more younger scouts. I have always said that the scouting director has been the worst ive seen in a while. The Reds scouting director isn’t good at his job? His track record stacks up with anyone in the game. I don’t even know what else to say other than you’re expectations simply can’t be in reality if you think Chris Buckley is not only not good at his job, but actually very bad at it. The kid was like a 30th round pick from a small school. Not a risky pick. Why not take a flyer on him? You never know if something will click inside a young prospect like him. As far as Buckley goes, he probably is the best scouting director we’ve had in decades. Look at all of the prospects he has brought in during his tenure. We didn’t draft & develop a single starting pitcher for nearly 20 years. Look at our stable of pitchers now. Hitters are harder to come by now because how baseball has evolved. I’ve been a Reds fan since the mid-70’s. I’ve seen a lot. He’s proven he has done a tremendous job. Can’t wait to see what he will do in this draft ahead.